Can I Buy from DCI? 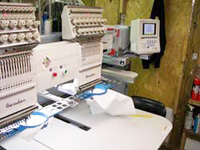 Employees in the embroidery program are using state of the art equipment insuring professional quality results. If you need the workmanship of embroidery to enhance an item, contact us now and let us show you how. DCI has serviced many agencies and not for profit organizations for many, many years.